Our range of diesel air compressors for sale are all Australian Design Registered for quality assurance. 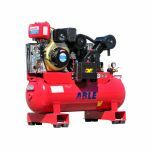 Buy a diesel air compressor for sale online for fast delivery across Australia or local pickup at our Melbourne Brisbane and Perth showrooms. Both compressors have their own advantages. The diesel compressors generate more power than petrol-powered compressors. Furthermore, diesel is thicker than petrol, which is important at high temperatures. Most compressor experts suggest using a diesel powered air compressor, especially if more power is needed. 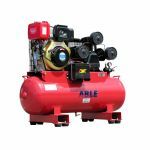 The diesel air compressor is made from highly durable materials and well-protected with a hard covering, these diesel compressors can guarantee effective operation for many years. Cheap air compressors pricing on all types including small portable air compressors. 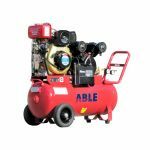 Companies worldwide look to Able Sales compressors as the solution to their requirements.